Gaurs are large wild cows that live in southern Asia. 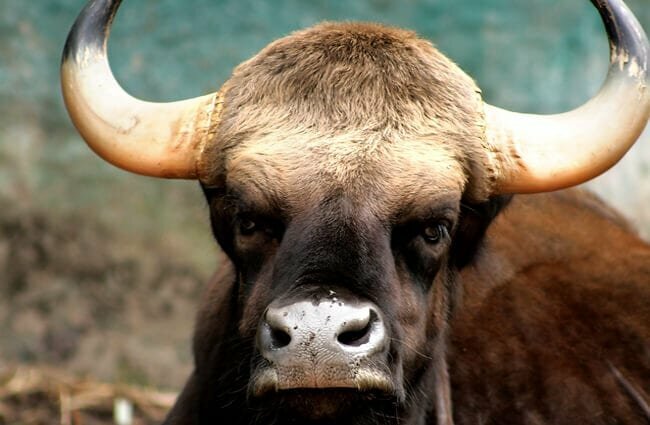 This species is the largest of the wild cattle, and even the largest animal in the Bovidae family. They outweigh the various species of buffalo, antelope, musk ox, and all other members of the Bovidae family. These large mammals are also known as Indian bison. 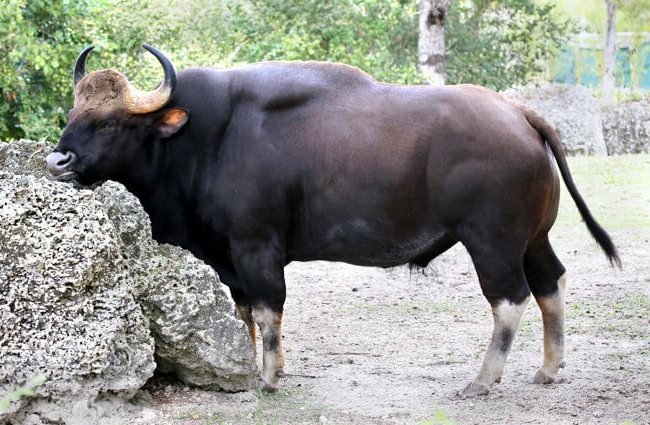 Read on to learn about the gaur. There really is no better way to put it… these creatures look like cows on steroids. Their bodies have an immensely muscular build and stout body shape. At their largest, gaurs are 10 ft. 10 in. long, 7 ft. 3 in. tall at the shoulder, and weigh 3,300 lbs. or more! Both male and female gaurs have horns, which are usually 45 in. long at their largest. This species of cattle is imposing to say the least! They are incredibly large and stout creatures. Learn more about these unique animals below. Tough Prey – As adults, very few animals can threaten gaurs. These massive mammals’ only predators are saltwater crocodiles and tigers. Younger calves or sick gaurs occasionally fall prey to leopards or packs of dogs. 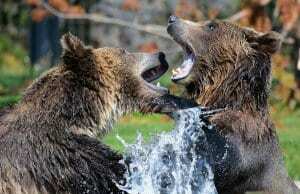 Arch Enemies – Though they do fall prey to tigers, they definitely don’t go down without a fight. Gaurs can kill tigers, and tigers can only rarely take down a guar if it hears or smells the tiger approaching. When a tiger approaches, gaurs form a circle around the young or weak members of the herd. 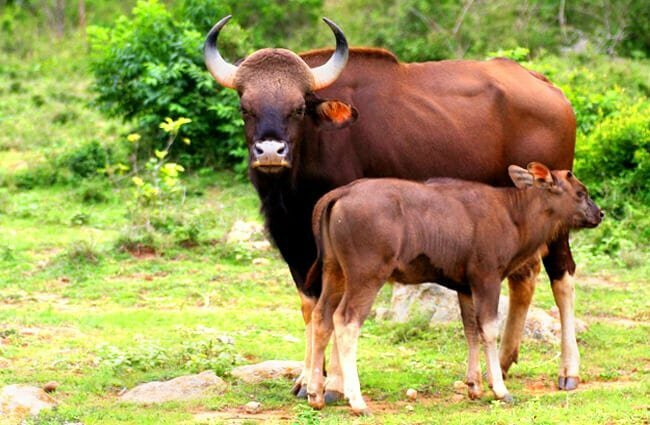 Gaur Subspecies – There are three different subspecies of gaurs. 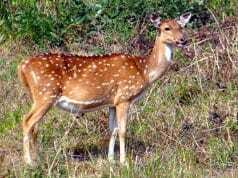 One subspecies lives in central India, another in Burma, and another in Malaysia. The easiest way to tell the difference between the different subspecies, which have no formal names, is their different sizes and colors. Despite their immense size, gaurs live in forests. They are most prolific in evergreen forests, but also live in semi-evergreen and deciduous forests. This species thrives in undisturbed forest, or areas where humans have not cut or used the habitat. Because of this, their populations are quite fragmented, and separated by large expanses of non-livable habitat. These cows also live in higher elevations and hilly areas, usually between 5,000 and 6,000 ft. above sea level. These creatures have broken populations across different areas of southern Asia. There are two major populations in India, one in the southwest, and another in the east. 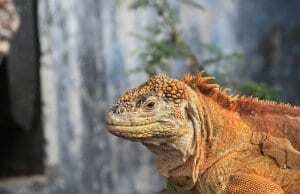 They also live along the mountains in Nepal and Bhutan. Other populations live throughout areas of Bangladesh, Burma, Laos, Thailand, Malaysia, Cambodia, and Vietnam. Gaurs have extremely variable diets. They are herbivores, but eat an immensely wide variety of plants. 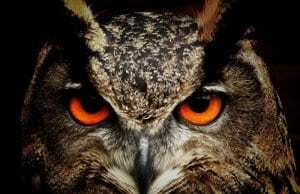 They are grazers of grass, and browsers of leaves and shrubs. Some of the different types of foods they eat are fruit, grass, leaves, stems, seeds, flowers, and more. While they do show preference for some types of plants over others, this usually varies by season. Like any other large hoofed animal, humans hunt gaurs. Even though it is illegal, poaching remains a serious problem in the decline of this species. Trophy hunting is also popular, because the species is so immensely large and impressive. Outside of hunting, habitat destruction poses a similar problem to this species’ decline. They do not like to live in forests that humans have altered in any way, and deforestation is obviously a serious problem for this reason. Humans have domesticated gaurs in some areas. 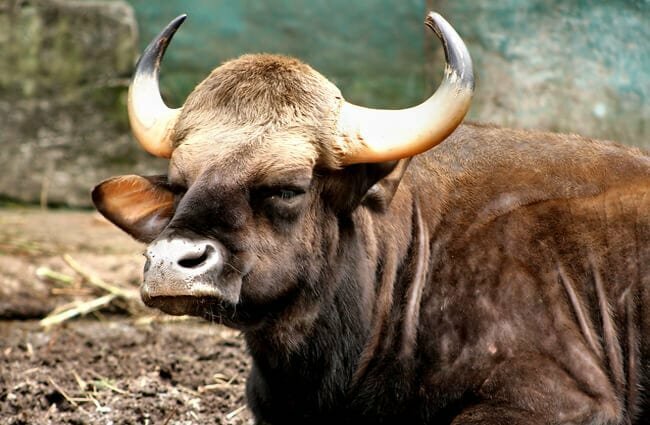 Domesticated gaurs, also known as “gayals,” or “mithuns,” undergo selective breeding. These domestic herds live in India, China, Bangladesh, and Myanmar. In some areas, they do not milk or use these cattle in fieldwork. Instead, they pamper them until they slaughter them as a ritual sacrifice. No, gaurs do not make good pets. They may look like giant cows, but they are very much wild animals. In a zoological setting, this animal’s care is very similar to that of other large members of the Bovidae family. Zoos must have strong, reliable fencing to keep the gaurs in. This species also needs more hiding places than other bovines, because they usually live in the forest. In the wild they eat a wide variety of vegetation. Because of this, zookeepers feed them pelleted feed, hay, and a wide variety of plants. These bovines are social, and they live in small herds. Most herds have between eight and ten cows, and a single bull. 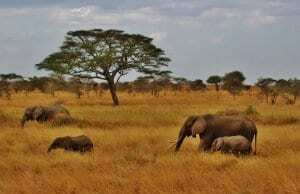 Females remain in their herds, while males vary in their social behavior. Some bulls move into all-bull herds outside of the breeding season, and some are solitary. The herds are matriarchal, and the oldest female is in charge. 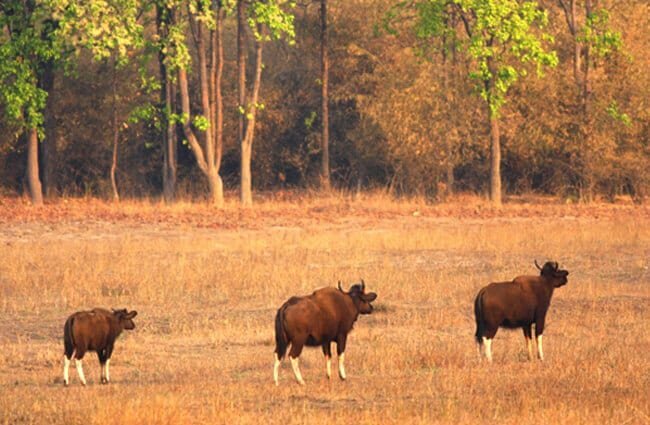 Male gaurs mate with multiple females in a herd, after fighting off rival males. 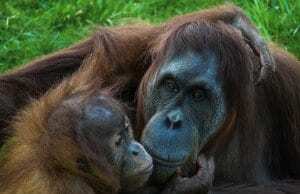 Females have a nine-month gestation period. 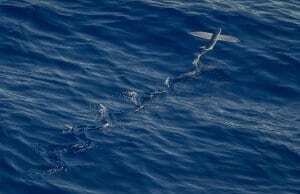 They usually give birth to a single baby, called a “calf,” though they occasionally have twins. The cows wean their calves when they are around seven months to a year old. Male calves leave their herd when they reach sexual maturity, but females often remain in the herd with their mother.